Mock Draft on Your Phone With Our Free App! 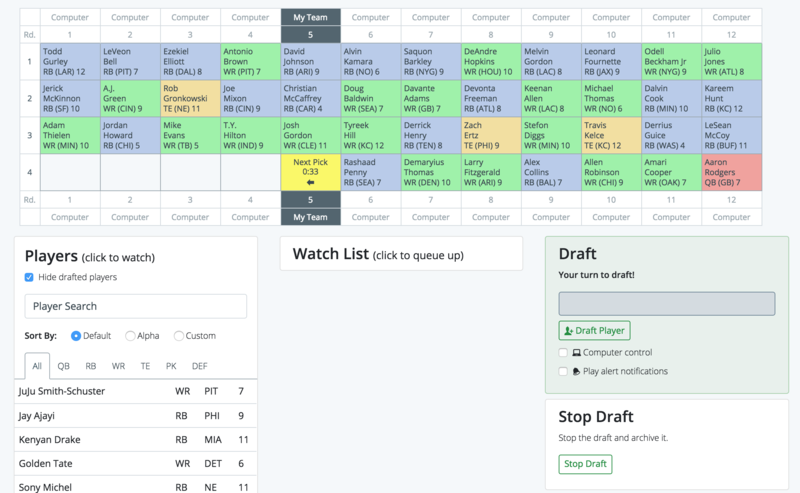 A fantasy football mock draft for 2019 is a free, fast, fun way to prepare for your real draft! Our drafters are the most dedicated fantasy football players you can find. What is a Fantasy Football Mock Draft? An NFL fantasy football mock draft is the best way to prepare for your real fantasy football draft. Pick a 2019 mock draft from the lobby above and draft against other people to practice draft strategies for the real thing. Choose from Non-PPR (previously known as 'standard'), points per reception (PPR), half-point per reception (Half-PPR), 2 Quarterback (2-QB), dynasty start-up, and dynasty rookie formats for your mock draft. If you just want to see the drafts that others have done, you can browse all the completed drafts or see the aggregated data on the ADP page. Use the custom draft simulator for when you want to draft instantly against the computer, or when you need to customize it for your keeper league. Fantasy football rankings generated from these fantasy football mock drafts are also available. Most people take a cheat sheet to their draft. You can generate a fantasy football cheat sheet based on our ADP data. Want a cool team name this year? Check out these fantasy football team names? This is a view of the fantasy football mock draft room. The rankings and computer algorithm will change depending on whether you are doing a standard/non-ppr, PPR, Half-Point PPR, Two Quarterback, dynasty or dynasty rookie mock draft. How Can I Practice For My Draft? Want to focus on just one format for mock drafts? Use one of the links below to go directly to drafts of just one scoring format. What is the Best Draft Strategy? Looking for the perfect draft strategy? Our innovative Draft Strategy tool goes deep inside our mock data to find what the best draft strategy at every position.